Today's reader request is Waterman Radiant Pink. Unfortunately, this ink is only available in cartridges. I ended up buying a box of short cartridges and emptying them into a sample vial. Cost wise, this ink is pretty expensive-$5.50 for 3.5 ml of ink. Radiant Pink is a bright magenta pink. In large swabs you can see a little bit of bright green sheen. Other properties: low shading, tiny sheen, and no shimmer. The sheen is only visible in large swabs on Tomoe River paper. On Staples 24 lb copy paper there was some feathering and bleeding in every nib size. 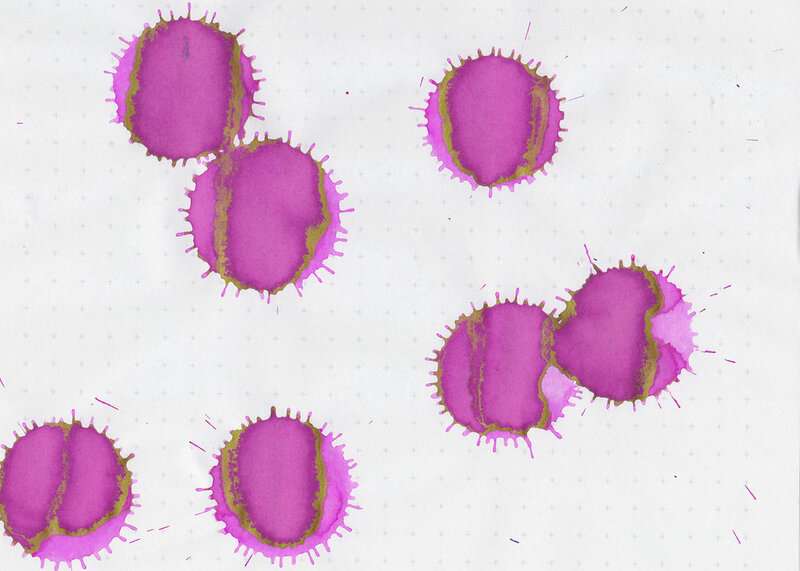 Ink swabs for comparison, left to right (top to bottom for mobile RSS): Diamine Deep Magenta, Waterman Radiant Pink, and Diamine Flowers Bougainvillea. Click here to see the Waterman inks together. Callifolio Andrinople, Diamine Claret, and KWZ Raspberry. Click here to see the pink inks together. Overall, this ink is pretty well behaved and is a nice color. It is a bit expensive for how much ink you get, as it is only available in cartridges. If you are looking for a bottled ink in this color, give Diamine Bougainvillea a try.